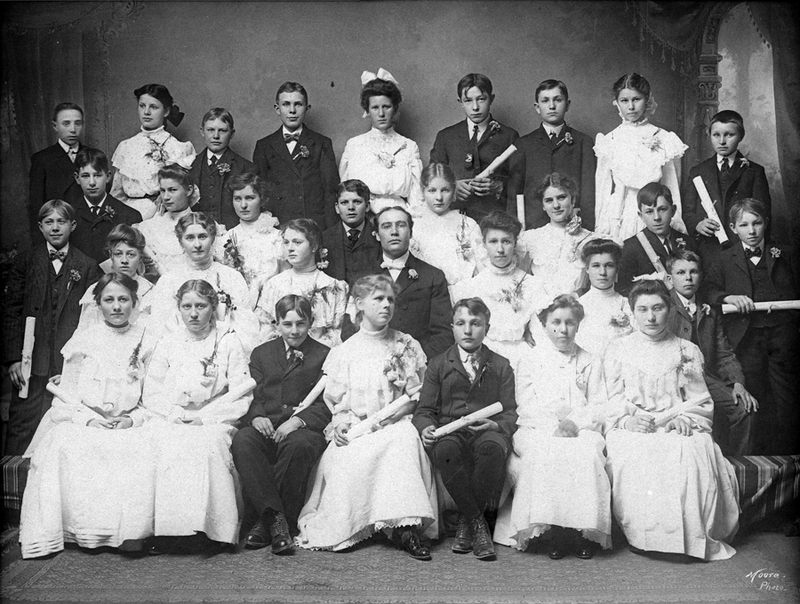 The Ebenezer German Congregational Church Confirmation Class of 1903. Front row from left to right: ?, ?, ?, ?, ?, ?, ?, ?, ? Second row from left to right: ?, ?, ?, Rev. Johannes Hopp, ?, ?, ? Third row from left to right: ?, ?, ?, ?, ?, ?, ?, ?, ? Fourth row from left to right: ?, ?, ?, ?, Magdalena Jost (Yost), ?, ?, ?, ? This photograph was donated to The Center for Volga German Studies at Concordia University by Valerie Miller and the Miller family. Written on the back of the photograph: Conrad Yost 767 Grand Avenue. Conrad's daughter, Magdalena (Lena) Yost (born 18 September 1888 in Norka, Russia) married Alexander Miller on June 1, 1910. Krieger, Joanne, trans. Ebenezer Congregational Church, Portland, Oregon 1892-1908. Portland, Oregon: 1999. Print. No confirmation class is listed in the church register for this year.